Apple made a big announcement last week about iBooks2 and digital textbooks. You can read my thoughts on it here. Some other teachers asked me what I use with my classes, since I don't use a textbook. The textbooks we have are 20+ years old, hard to understand and not very good in general. Instead, I use a collection of resources with my students. (I do use a Physics textbook, Giancoli Physics, with my AP class). All of my lesson plans and resources are organized in Evernote. This is where I have unit and topic lesson plans, objectives, links, activities, projects, and all of my files. It is also what I use to organize and schedule what I'm doing each day in class. Students may check out one of our physics textbooks if they want, but no one does. There are also a variety of textbooks in my class that students can use if they want. 1. Lecture notes - I do a lot of labs, projects, and investigations with my classes, but I start each topic off with a short lecture and discussion, example problems, along with demonstrations and applications of the topic to real life. There are also short video clips and animations which help explain concepts. I want the students to have a basic understanding before going off on their own. The lectures are usually on PowerPoint with links, videos and live demos. The PowerPoint slides are posted on the class website. 2. Class website - the class website has the lecture notes, handouts, links, and other resources for the students. 3. Class blog - the class blog is where I have links, post class updates, and post assignments and reminders. 4. Problem sets - each section has problem sets. The packets have a short summary of the concept, as well as example problems and then the practice problems students do. They start the "homework" in class so that I can assist them and then they finish them at home. These packets become a mini-textbook of sorts. They also get lots of other handouts, including math reference, physics equations, problem solving tips, and more. 5. Labs, Projects, and Activities - we do at least 2 labs for each topic and a lot of projects and activities through the year. We use software (Multimedia Science School), along with websites, webquests, hands-on labs, and research and design/build projects. Many labs are done virtually using PhET. Projects include balloon launch for projectile motion, bridge building for forces/stress, and rockets at the end of the year, among others..
6. 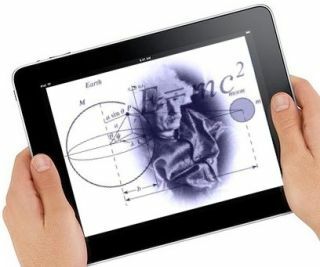 E-textbooks - I provide links to online physics textbooks and downloadable physics textbooks so that they have them as a resource. I do not specifically use them or refer to them in class. 7. Websites - there are a couple of great websites I use with the class, including the PhysicsClassroom, PhET, and some great videos on different sites. I have also found Dolores Gende's site to be invaluable to me as a teacher and to my students. She has some great Physics resources and links on her site. 8. Discovery Education - I use Discovery Education Streaming for videos, I get images and lesson ideas from the STEM Academy and Science of Everyday Life and the Discovery Educator Network. There are over 25 Free Resources for educators to use. These are the main resources. There are more. I get resources from different textbooks, web sites, other educators and more. What do you use, instead of / in addition to, texbooks in your classroom? 1. The Physics Classroom - this site is excellent. It has a tutorial section (online lessons with links, practice problems and simulations) along with a review section, help for solving word problems, links, multimedia resources and much more. The lessons are in easy to understand terms and each subject area is broken down into small parts. One of the best physics resources available. 2. PhET - Online or downloadable simulations and virtual labs. There are also teacher created lesson plans and resources for each lab/simulation. The quality of these resources is excellent and they really help students visualize and learn physics concepts. There are also simulations/virtual labs for Chemistry, Biology, Math and Earth Science. 3. Physics Study Guide wikibook - great content and explanations and has links to other resources. Can be used as a study guide or even as a basic textbook. 4. Motion Mountain - free downloadable Physics textbook - covers kinematics, light, electromanetism, relativity, and some other topics. 5. FHSST Physics online wikibook - Free High School Science Texts - covers all the physics concepts and has explanations and examples. Can easily be used as an e-textbook. 6. AP Physics B video lectures - excellent videos about each topic in physics. Great for review or for students who want another explanation of a concept. Geared towards AP Physics B, but can be used for any physics class. 7. Learn AP Physics - has practice problems, links, explanations, and videos. Includes some of the videos from #6 above. Geared towards AP Physics, but can be used for other classes also. 8. Online Physics Study Guide - topic explanations, simulations, practice problems, and more.